The Rengo Game Window looks a little different to the normal game window. Rengo is a team game which requires 4 players. 2 players take it in turns to play the black stones, the other two players take it turn to play the white stones. Whoever creates the Rengo game has to select all the settings and teams. The first two names in the list play in team A, the second two names play in team B. The first name in each team plays first. You can use the Nigiri buttons to choose the pairings. Leaving the Nigiri stones in place will mean that KGS randomnly assigns you a colour. You can click to select a Black and White stone to set up the teams manually. If somebody has challenged, and you do not want to play with them, use the Down arrow beside the player's names. Clicking on this brings up a list of everyone who has challenged, you can select a name from this list to replace the player you do not want. 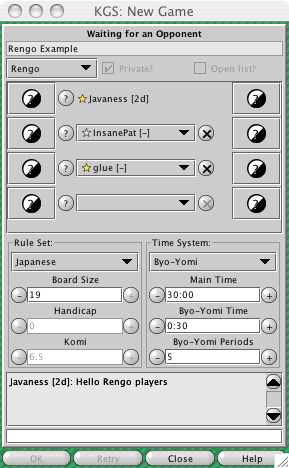 You will set handicap, komi, rules and time in the normal fashion.